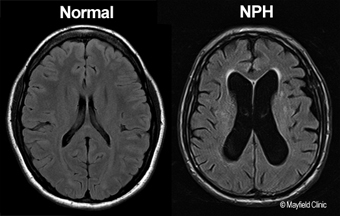 Normal pressure hydrocephalus (NPH), despite its name, is an abnormal condition. It occurs in older adults when cerebrospinal fluid (CSF) builds up inside the brain's ventricles. The enlarged areas stretch and damage the brain, causing symptoms of mild dementia, walking difficulties, and urinary problems. NPH often goes untreated because it can resemble Alzheimer's or Parkinson's disease. But if diagnosed early, NPH may be treated with a shunt device that drains fluid from the ventricles and returns them to normal size. Normal pressure hydrocephalus (NPH) is a progressive condition that occurs when there is too much cerebrospinal fluid (CSF) in the brain. Normally, CSF is produced inside two large cavities in the brain called ventricles. Figure 1. Cerebrospinal fluid (blue) is produced by the choroid plexus inside the ventricles and is constantly being absorbed and replenished. 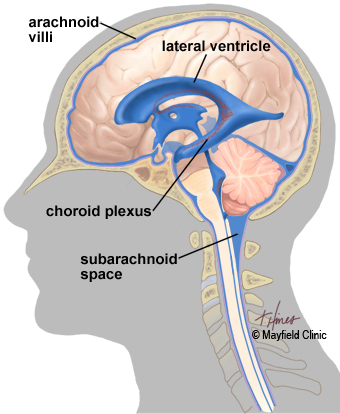 It circulates out of the ventricles and into the subarachnoid spaces surrounding the brain and spinal cord. CSF is absorbed by the arachnoid villi along the top of the brain. The fluid flows in and around the brain and spinal cord to cushion and protect them from injury (Fig. 1). Veins at the top of the head absorb CSF into the bloodstream at the rate of about one ounce per hour. NPH occurs when the normal volume of CSF is not absorbed fast enough, causing the fluid to collect in the ventricles. Figure 2. 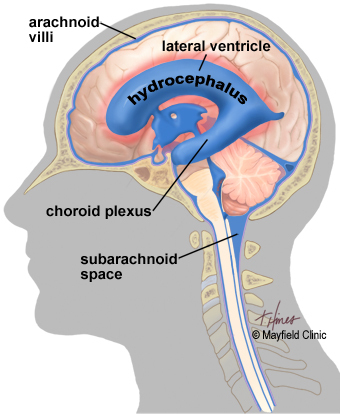 In normal pressure hydrocephalus, an excess of CSF enlarges the ventricles, stretching the brain and causing symptoms. As CSF slowly builds up in the ventricles, they enlarge and stretch the brain (Fig. 2). This can damage nearby nerve fibers that control the legs, bladder, and memory. NPH can be hard to diagnose because it can resemble other, more common causes of dementia or Parkinson's. If diagnosed early, NPH can be treated with a shunt device that drains the excess fluid and reverses some of the symptoms. Walking difficulty appears as an unstable or shuffled gait, a feeling that one's feet are stuck to the floor and unable to step up. Mild dementia can include memory loss, forgetfulness, and decreased attention span. Urinary problems vary from frequency and urgency to actual incontinence. A person with NPH typically has more problems with walking than with memory and has had symptoms for a relatively short time. Someone who has been in a nursing home for several years with severe dementia but is able to walk reasonably well probably does not have NPH. NPH is believed to account for 5% of all cases of dementia. The condition primarily affects older people, and as the population is living longer, the incidence of NPH is increasing. NPH can develop from no known cause, or it may occur as a result of a closed head injury, brain surgery, meningitis, or a ruptured aneurysm. An accurate diagnosis is important because people with NPH who go untreated are likely to continue to decline. They also are likely to suffer unnecessary loss of independence and reduced quality of life. Diagnosing NPH is difficult because the symptoms and enlarged ventricles that characterize it are also seen in many other conditions. NPH can resemble Alzheimer's, Parkinson's and vascular dementia. It can also mimic progressive supranuclear palsy and dementia with Lewy bodies. Figure 3. MRI scans of normal and enlarged ventricles. A person who is suspected of having NPH begins consultation with a neurosurgeon or neurologist. The doctor reviews the patient's medical history and performs a physical exam. A computed tomography (CT) or magnetic resonance imaging (MRI) scan is ordered to look for enlarged ventricles or other signs of blockage (Fig. 3). If the scan is normal, the patient does not have NPH. If Parkinson's disease is suspected, the doctor may prescribe a course of levodopa medication. Levodopa would help a patient with Parkinson's but would not ease symptoms of NPH. Gait testing also can be used to distinguish Parkinson's from NPH. People with NPH tend to have an ataxic gait — a wide, penguin-like walk in which the legs are stiff and the foot may drag and catch — whereas people with Parkinson's tend to walk with small, shuffling steps. Sometimes the gait of NPH and Parkinson's disease may not be distinguishable with the naked eye. In those cases, the patient may undergo testing with a gait map, a long mat that records the timing and regularity of a person's stride, step length, and cadence. A neuropsychologist may test the patient's memory and cognition. This exam may rule out another diagnosis, such as Alzheimer's disease or non- Alzheimer's dementia. If NPH remains a possible diagnosis, the patient is scheduled to undergo a lumbar drain trial. A drain trial is a "test drive" to determine if a CSF shunt will improve the patient's symptoms. If the patient is taking blood-thinners, he or she is required to stop the medication 7 to 10 days prior to the trial. The patient then is admitted to the hospital. Upon admission, a physical therapist evaluates the patient's gait to establish a baseline of their balance and stride. Figure 4. In a lumbar drain, a hollow needle is inserted into the fluid-filled subarachnoid space in the lower spine. A flexible catheter is inserted through the hollow needle and the needle is removed. Cerebrospinal fluid (CSF) is collected for a few days and CSF pressure is monitored. A local anesthetic is used to numb the area in the lower back. The surgeon inserts a temporary catheter into the spinal canal to drain CSF (Fig. 4). The patient remains in the hospital for 3 to 4 days while CSF is drained periodically and your condition is monitored, especially your walking ability. Family and friends may visit and keep you company. After 72 hours, the drain is removed and the physical therapist performs a second evaluation of the patient's gait. A repeat neuropsychological exam is also performed. If the patient's memory and gait are markedly improved following the drain trial, a positive diagnosis of NPH can be made. Any improvement in symptoms from the drain trial will last only a few days. Symptoms will return to their previous state. If, after testing, physicians determine that a patient does not have NPH, the patient should be referred to a neurologist. The neurologist will consider whether the patient has another disease that mimics NPH, such as Alzheimer's disease or brain atrophy. Treatment will depend on the actual disease process that is occurring. There is no cure for NPH, and there is no medication available. However, a CSF shunt can provide symptom relief to some patients. Implanted surgically, the device removes excess fluid from the ventricles. If the lumbar drain trial is successful, the patient may be a good candidate for a permanent CSF shunt. Because NPH is usually a progressive disorder, the shunt extends quality of life for the patient but symptoms of NPH may return. Sometimes a patient with NPH may be unable to have a shunt because of other health problems that would make surgery unsafe. Treatment of that condition may improve the patient's health enough so that he or she can undergo shunt surgery safely. A neurosurgeon and general surgeon work together to implant a ventricular peritoneal (VP) shunt. 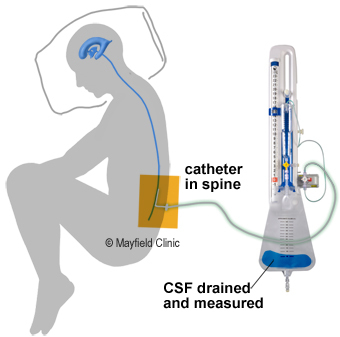 The flexible, tube-like device drains excess CSF from the brain to the belly area (Fig. 5). Figure 5. A programmable shunt has three parts: (1) a ventricular catheter that connects to a (2) valve system that regulates the pressure or flow of CSF down a (3) peritoneal catheter into the abdominal space. 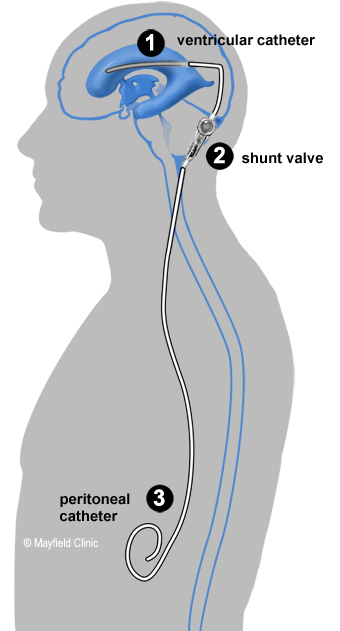 The shunt has a valve that opens to release fluid when the pressure builds up. The fluid drains into the abdominal space and is later absorbed. The drain tube can also be placed into the lung or the jugular vein. The surgery is performed under general anesthesia and lasts about 90 minutes. Step 1. An incision is made in the scalp at the back of the head. A small hole is drilled in the skull. A catheter is passed through the brain to rest inside the enlarged ventricle. Step 2. An incision is made behind the ear. The shunt/valve is inserted and the ventricular catheter is attached. Step 3. Another incision is made in the belly. Next, a tunnel is created under the skin from behind the ear, extending down the neck and chest and into the abdominal area. A peritoneal catheter is connected to the shunt/valve to carry the excess CSF to the belly, where it will be absorbed. The patient remains in the hospital 2 to 3 days. At first, the area over the shunt may be raised up, but as the swelling goes away, the shunt is usually not noticeable. Spinal headaches are caused by leakage of CSF around the catheter or shunt site. Lie flat and drink plenty of caffeinated noncarbonated fluids (e.g., tea, coffee). Patients should take it easy for several weeks after surgery, with no bending, twisting, heavy lifting, or wearing of tight-fitting hats. Incisions need time to heal. Patients may shower as directed by their surgeon but should not take a tub bath or submerge in water for 4 weeks. Incisions should be patted dry with a soft towel to avoid irritation. Call the surgeon's office if the patient's temperature exceeds 101° F or if the incision begins to separate or show signs of infection, such as redness, swelling, pain, or drainage. If the patient has a severe headache, vomiting, and a stiff neck that prevents lowering the chin to the chest — this is an emergency — go to a hospital. These are signs of bleeding in the brain. Most patients with an NPH shunt will see the neurosurgeon 2 to 3 times during the first year following their surgery. The first visit occurs shortly after surgery and involves checking the incision and following up with any issues the patient might be having during the early recovery period. Later follow-up visits will involve an evaluation to make sure the shunt isn't draining too much or too little. If necessary, the doctor can adjust the shunt programming with a controller from outside the body without additional surgery. The physician may also request a CT scan to check the ventricles. In some cases, a non-programmable shunt will be implanted. Placement of an adjustable vs. non- adjustable shunt valve is a matter of preference and debate among neurosurgeons. Talk to your doctor about which device is best for your situation. No surgery is without risk. Potential complications from the surgery itself include bleeding in the brain or ventricles, infection, seizures, and problems with anesthesia. Complications that can occur later include shunt malfunction from a clog or infection. This causes CSF to build up and a return of the original symptoms. Call the doctor if you experience abnormal symptoms. Blockages can often be fixed. In rare cases, the shunt may need to be replaced. If the ventricles decrease in size too rapidly, the brain can pull away from the skull and tear small blood vessels. This can cause blood clots around brain (called a subdural hematoma). Programming of the shunt to drain CSF at the proper rate and regular follow up visits with the doctor ensures the system is working optimally. Some patients treated with a shunt will have dramatic symptom relief. Studies show that 50 to 80% of patients can expect improvement of their symptoms in the first 2 to 3 years . Other patients may have a less successful outcome. Several factors determine the outcome, including the patient's overall health, what caused the NPH to occur, and how long the patient has had NPH. Early diagnosis and treatment improve the odds of having successful symptom relief with a shunt. Patients who have had symptoms for less than a year or have mild to no dementia do better . Men, and all patients of advanced age, are less likely to show improvement in thinking and memory after a shunt operation . Another study found that while significant improvement in ataxic gait and urinary incontinence can occur, improvement of dementia is uncommon . Why some patients improve and others do not is the result of two factors. First, scientists do not completely understand what factors cause NPH to occur. Second, neurosurgeons differ on how to diagnose, treat, and measure success in patients with NPH. Because NPH is a lifelong disease, an implanted shunt can provide relief of symptoms, but it cannot provide a cure. Each year Mayfield neurosurgeons perform approximately 80 shunt surgeries to treat hydrocephalus caused by a blockage (obstructive) or an excess of cerebrospinal fluid (communicating). Normal pressure hydrocephalus (NPH) is a form of hydrocephalus that requires a careful and experienced diagnostic evaluation because its symptoms can resemble those of Alzheimer's or Parkinson's disease. Each year we evaluate people with presumed normal pressure hydrocephalus. We are one of the few treatment centers that specializes in hydrocephalus and normal pressure hydrocephalus.